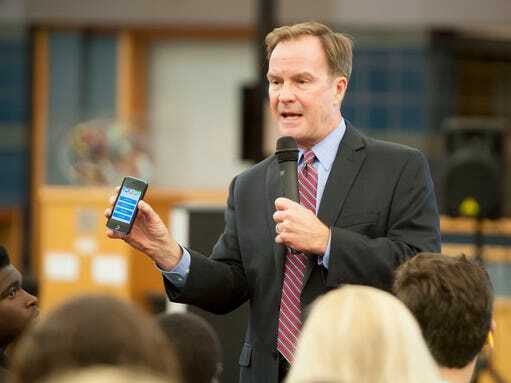 Attorney General Bill Schuette announced Wednesday a new anonymous hotline students can use to report potential harm or criminal activities in school. OK2SAY, a student safety initiative, is available to Michigan students starting this school year. Schuette made the announcement Wednesday at University Prep High School in Detroit. He was joined by Detroit Chief of Police James Craig, University Prep Schools CEO Mark Ornstein, Michigan State Police Lt. Mike Shaw, Sandra York, executive director of Michigan PTA, and recording artist Keenan West, an anti-bullying advocate who wrote the OK2SAY theme song. Attorney General Bill Schuette holds press conference at UPSM for new school safety initiative called OK2Say. Attorney General Bill Schuette was in Detroit this morning to talk about a new school safety initiative called OK2Say. State officials are banking on a new student safety reporting system — called OK2Say — to help reduce school violence in Michigan schools. “We want schools to be places of learning, not violence,” Attorney General Bill Schuette said during a news conference this morning. Schuette and a host of other officials have been rolling out the new system, which began this month, across the state. Today, they brought the message to University Preparatory Science and Math Academy in Detroit.